Threading through the history of the United States is a long line of reviled newcomers. In the 1850s, Irish and German Catholics were vilified by the Know Nothing movement. In the 1890s, Italians were subjected to frequent lynchings. Jews of the 1930s were excoriated by Father Charles Coughlin, Henry Ford, Charles Lindbergh, and the Ku Klux Klan. In the years following September 11, America’s 2.6 million Muslims have often found themselves facing similar kinds of hostility. And, while it’s certainly true that concerns about extremism among a tiny minority are justified—some of the foiled terrorist plots since 9/11 did involve Muslim citizens who intended grave harm to the United States—it is equally true that the wider community of American Muslims has, for the past decade, borne a deeply unfair burden of prejudice and misunderstanding. Yet, like Catholics, Italians, and Jews before them, Muslims persist in coming to the United States. 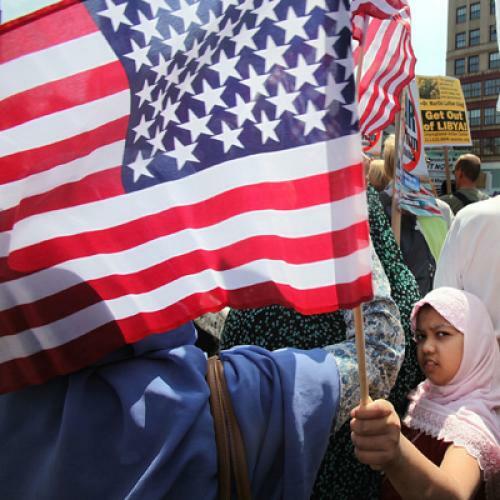 According to Pew Research, even after September 11, the number of Muslims granted permanent resident status or a green card has risen, from 66,000 in 2000 to 115,000 in 2009. Which raises the question: If the United States is such a hostile place for Muslims, why do they still make their lives here? OVER THE LAST DECADE, I’ve devoted my working life to reading about, talking to, and writing about Muslims. Many are those I’ve met in Iran, Afghanistan, Pakistan, Turkey, Syria, Jordan, Palestine, and other places where they constitute the majority. Those Muslims who decide to immigrate to the United States reach a country in which they are one of the smallest minorities—about 0.8 percent of the population, according to the most carefully calculated estimates. There are many others—the Afghan teenager who fled the Taliban on foot and now, much older, works terrorism cases for the New York Police Department; the Brooklyn imam who welcomed me into his mosque when I wasn’t veiled; the Iranian woman who left Iran for the United States because her Facebook posts supporting the Green Revolution had put her family in jeopardy. Pew Research has revealed some other intriguing facts about the Muslim community here. American Muslims are different from their counterparts in Europe—better educated, better off financially, and much more disapproving of terrorism. About 71 percent will tell you that, if you work hard, the United States will reward your efforts. Slightly more of them, about 73 percent, say they have never been discriminated against. They report that Muslim women are treated better here than in their home countries. They think assimilation is a good thing. These are the quiet majority. They rarely make it into newspapers, Hollywood movies, the criminal justice system, or congressional hearings. What I wish is that these Muslims could be at the forefront of Americans’ views of Islam at home. Instead, center stage is occupied by the anti-sharia movement, Representative Peter King’s hearings on Muslim radicalization, the Park51 Islamic community center in lower Manhattan, or a tiny Florida church’s burning of a Koran. We’d do better to take a closer look at the conditions American Muslims endured in their native countries, such as those experienced by a woman who works the register at a halal grocery store in my Harlem neighborhood. Lorraine Adams is the author of two novels, Harbor and The Room and the Chair. She is working on a third set in Pakistan. This piece ran in the September 15, 2011, issue of the magazine.